Make a habit of it! You know, I was recently thinking about the habits I have. Like everyone I have some good habits and bad habits and it made me wonder why we never think to capitalize on this concept? 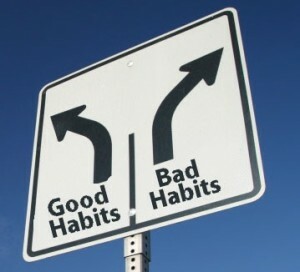 Habits are behaviors that are regularly repeated and can even occur subconsciously. Habitual behavior often goes unnoticed, because a person does not need to engage in self-analysis when doing a routine task. Habituation is one of the simplest forms of learning, in which an organism, after a period of exposure to a stimulus, stops responding to that stimulus in varied manners – technically speaking. Habits are sometimes compulsory. The process by which new behaviors become automatic is habit formation. Old habits are hard to break and new habits are hard to form because the behavioral patterns we repeat are imprinted in our neural pathways, but it can be done. The general population only seems to be interested in the bad habits. If someone had a habit of helping seniors with their groceries or helping them with chores, no one would care. If a guy had a habit of womanizing, we could draw a crowd pretty quick. What if we were able to effectively trick our bodies into forming habits that were good for us? I mean instead of just falling into a bad habit, what if we were calculated with forming a good habit? Our bodies seem to respond well to repetition and at least in theory it would work. What if we formed a habit of eating five servings of vegetables and fruits per day? What if we made it a habit of giving our kids a daily dose of encouragement? What if we made it a point to make someone’s life a little easier every day? Whether it’s at home or at work, there are people in our lives who would be affected in a positive way if we thought to give them some unsolicited help. It is the little things in life that make it worth living. It’s the things that money can’t buy. I need to make a habit of exercising daily. I need to make a habit of building the reputation of a helper. I need to make a habit of visiting my parents weekly. I need to make a habit of eating more salad. Previous Post How about your life?